So you’ve gone through your child’s bedtime routine, and now they’re in their bed, but you’ve suddenly realised, that they don’t seem completely tired, or they’re tense, and you’re worried it’s going to take them ages to get them to sleep. Last night I was in this position, and when my daughter asked for another story, I said I would tell her a story. I told her about a day trip we had planned with some friends. I said we looked for a restaurant to have lunch in, and went in one and looked on the menu, and all the menu said was ”carrots, carrots, and more carrots.” She laughed at this. I then continued the story as they looked for another restaurant. They went in and looked at the menu, and it all it said was ”peas, peas, peas and more peas.” She laughed again. If you’re a regular reader of my blog you’ll know that laughter helps to release melatonin, the sleep hormone, so a few last minute giggles can be just what our child needs to fall asleep easily. Telling silly stories, especially ones where the grown-ups are in the less powerful role is one of many ways that laughter can be used to help your children fall asleep more quickly. Sleep is a separation for children so they need to feel well-connected, and free of emotional upset in order to fall asleep easily. Hand in Hand parenting is all about helping children with the emotions that can make sleep hard. Looking for more info? Check out 5 Sleep Secrets For Peaceful Nights. Hand in Hand parenting also has an online self-study sleep course. When my 6 month old daughter didn’t sleep through the night, I wasn’t really looking for a solution, I didn’t like the concept of sleep training. We co-slept so when she woke it was easy simply to just feed her and then fall back to sleep. I was still getting my full eight hours with a few short interruptions. I assumed that she would sleep through the night eventually. But after eight months, nothing was changing. I started to wonder why she was waking more than she did as a newborn. When I fed her she didn’t seem that hungry, and just sucked for a minute or two before falling asleep again. 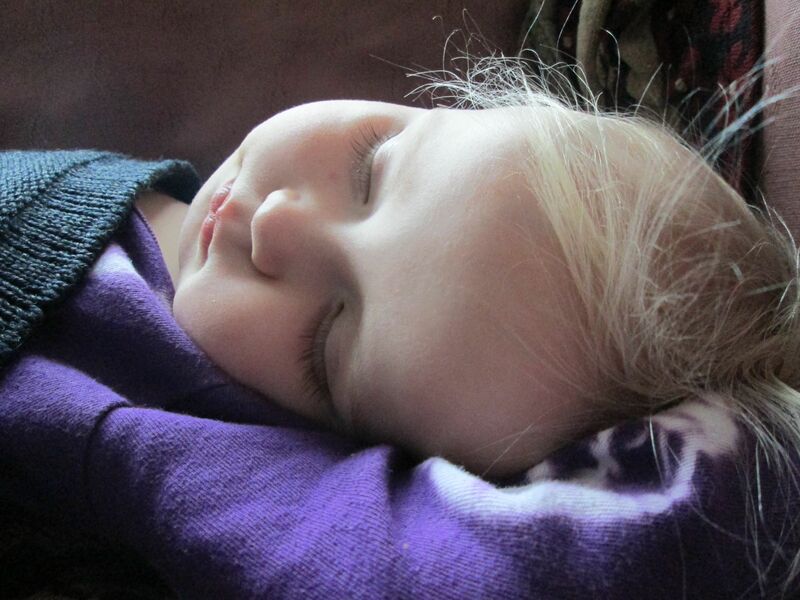 I read about sleep cycles, and how a baby needed a way to soothe herself back to sleep. It made sense that other babies were self-soothing back to sleep with their thumbs or a dummy, whereas I was my daughter’s comfort mechanism. But I thought that this couldn’t be the full story. My daughter had on occasion slept in four hour stretches. She also always woke half an hour after falling asleep; I knew that had nothing to do with being hungry, or transitioning through sleep cycles. Before my daughter was born, I’d read a book called The Aware Baby. The author Aletha Solter explains that in the first three months of life, all babies spend some time each day crying ‘for no apparent reason.’ She explains that this kind of crying has a healing function. In a study conducted by Dr. William Frey, he compared real ‘emotional’ tears with those caused by chopping onions. He found that emotional tears contained stress hormones such as cortisol and other toxins. Crying is a way that we can literally release stress and tension out of the body. All babies inevitably experience stressful events, such as a difficult birth, medical interventions, or just the daily stress of getting to know their new stimulating world. The understanding that crying was healing made sense to me. I’d gone through a difficult period in my life in my mid-twenties, when I’d felt depressed and physically exhausted. I’d written for therapy, done yoga, meditation, and also deep tissue massage. I often found that these modalities took me deeper into my sadness, and I would release my feelings through crying. I always felt much better afterwards, and eventually my depression lifted, and I felt a renewed sense of self and happiness. Knowing about the healing function of crying helped me through the early colicy days of my daughter’s life. There were times when I didn’t bounce my daughter, pace the room or feed her. There were times, when nothing much worked but to listen. And what I found were those were the times when I’d had the deepest connection with her. By witnessing this pain that she felt, I felt connected to her deepest self. It was heartbreaking that she needed to cry so much, that she had so much suffering inside of her. But it also felt wonderful that she had this way to heal. Her birth had been difficult, but now I was able to cuddle her close to me, and tell her she was safe now as she expressed these strong feelings. During the first few months of my daughter’s life, I fed her whenever she cried. As I didn’t use a dummy or, put her to sleep by herself, it seemed natural that eating and sleeping became intertwined. I fed her to sleep, but after a couple of months, that stopped working easily, so I would pace the room until she was more sleepy, and then try to feed her to sleep again. It took me a while to realise that these were what Aletha Solter, calls ‘control patterns;’ things to stop the crying that become habits that the baby comes to rely upon. I had thought I was helping her to sleep, but then I began to think, maybe what I was actually doing was repressing the feelings that she wanted to let out before she slept. So next time my daughter needed to take a nap, I sat on the bed, and held her. She made some slow tired cries, and I watched her face look visibly more and more relaxed. She looked so peaceful, as if she had been doing some baby yoga or meditation! She fell asleep much more easily than if I was pacing the room. I did this a few times, but I still felt some confusion about whether it was really okay just to let her cry. Sometimes she would ask to breastfeed, and then I would feed her. It wasn’t long before the habit of feeding to sleep had crept back. Yet occasionally I thought to myself, that she probably wasn’t hungry, and was just asking out of habit, because if we were out, then she would just fall asleep in her buggy without needing milk. When my daughter was eight months old, I realised she was hardly crying at all. I still believed in the idea that crying was healing. And I missed that deep connection that I had with her when she cried. I noticed that when I fed her to sleep at night, she seemed to wriggle around a lot and have a lot of tension in her body. Feeding her to sleep wasn’t helping her relax. I reread The Aware Baby and realised that I’d forgotten most of its contents since my daughter had been born! My daughter was feeding every two hours, which I had always been puzzled by. All of the other babies I knew went 3 or 4 hours between feeds. Aletha Solter, explains that breastfeeding every two hours can be a sign that it has become a ‘control pattern.’ Other babies might have been using pacifiers or movement as their control patterns, but for us it was breastfeeding. I also realised that because breastfeeding was a control pattern, then she would ask for the breast out of habit even when she wasn’t hungry. Aletha Solter also says that all healthy babies over six months of age are able to sleep through the night. She explains that babies above this age wake because of emotional tension. Just like adults, babies who have stress and tension, have trouble with sleep. I decided to try again, and let my daughter fall asleep without breastfeeding. This time the cries were powerful. I sometimes doubted whether I was doing the right thing, but then I’d look at her face, when she’d just fallen asleep after a big cry. She would smile and even giggle sometimes as she fell into dreams. It was clear that she’d cried away her upset and felt peaceful again. I felt more certain that listening to her cry was the most loving thing I could do, and started looking for more resources to support me. The idea seemed so different to what I read and heard everywhere that I needed to know there were other parent educators and thinkers out there who understood the healing nature of crying. I returned to a website I’d looked at before called Hand in Hand parenting. I read some articles, and was relieved to hear Patty Wipfler’s compassionate advice, that it’s natural that in the close breastfeeding relationship children often come to depend on the breast for comfort. I downloaded a podcast from Hand in Hand, called ‘Helping your child sleep.’ These ideas, along with Aletha Solter’s, helped me to figure out what I needed to do to help my daughter sleep. I started with the first time she woke up, at 9pm. Instead of feeding her I held her instead. She cried for just a few minutes and then fell back to sleep. I fed her as normal for the rest of the night. The next night, she slept right through the time of her first waking the night before, and didn’t wake up till 11pm. When she woke I repeated the process of holding her instead of feeding her. The next night she slept right the way through till 1am! Sometimes when she woke, I could just hug her, and that would be enough for her to fall asleep. Other times she would have a big cry. Within a couple weeks she was sleeping through the night, and she now sleeps through the night, all of the time, apart from the occasional illness or emotional upset. She has become more relaxed and confident, as a result of being able to release her feelings through crying. And I feel so much closer to her, now that I’ve learnt how to listen to her more closely, rather than simply trying to stop her from crying. In all the debate about baby’s sleep the experts divide into two factions. On the one side, there are those that think we should leave a baby to cry it out, so that they learn to sleep on their own. On the other side are the ones that think we should do whatever we need to do to stop our children from crying. But there is a third way that involves a deeper understanding about the nature of crying. That we don’t have to leave our children alone when they cry, that we can hold them and support them, and help them heal, so that they naturally sleep better. When we take the time to listen to our own children it can trigger the strong feelings of not being listened to as children. This and the common cultural idea that crying is a negative behaviour we must stop as quickly as possible makes it hard for us to listen to our children cry. Now when my daughter cries, I don’t actually think of it as a ‘bad’ thing. Of course I’d rather she was happy and smiling, but when she cries, I know she’s doing the most intelligent thing she can, healing from her hurts and upsets. When we listen to our children when they have upset feelings, they can heal from the stress and tension that cause off-track behaviour such as aggression. Our children use ‘misbehaviour’ as a red flag to tell us they’re not feeling good. Listening allows our children to express their feelings through crying so they don’t have to resort to more indirect ways to tell us how they’re feeling. Listening to our children cry is not easy, particularly if we weren’t listened to as children. In order to listen to our children well, we need to be listened to ourselves. Hand in Hand parenting has a wonderful (and completely free!) listening partnership scheme where parents can get together and exchange listening time with each other. This helps us to work through some of our difficulties, and to find our sense of well-being again. I’m always amazed at how spending ten minutes talking about my feelings after an exhausting day with my daughter, gives me such a sense of renewed energy that I can delight in being with her again. Adults do not cry as easily as children, and this is partly because our feelings were suppressed when we were young. Through my listening partnerships I’m rediscovering my ability to cry easily, and learning first hand about just how healing crying can be. What I’ve learnt is that it’s never too late to find ways to heal, and change and develop as a person. Throughout my life I’ve met many people like me, looking for ways to shed that baggage they have carried throughout their lives. What a wonderful gift it is to give our children, to help them heal while they are still young, before the baggage gets too heavy. They can grow up retaining the lightness they have as children. Are sleep struggles with your child leaving you exhausted? Hand in Hand Parenting offers an online self study course. Click here for more details. This article was previously published in Juno Magazine, issue 34.